Ever since NetEnt’s establishment in 1996, the Swedish software supplier developed over 200 online casino games. With the NetEnt slots as the most popular online casino games, it is no wonder that every month at least one new video slot is added to the NetEnt Games suite. With over 100 slots developed by NetEnt, you can expect a wide range of themes, some scarier than the other while a lot of cheerful slots can be found at the NetEnt Casinos as well. Stickers™ definitely belongs to the category of cheerful slots with bright and colourful fruit and letter symbols added to the reels. The relaxing though cheerful tune and uncomplicated gameplay are the hallmarks of the Stickers™ slot and I am sure you will find yourself immersed in a serene world of colours and fun. It is not the first time I see NetEnt going for ‘less is more’ when developing a video slot, targeting casual and experienced players or simply those who rather don’t be frightened by Dracula™, Zombies™ or Aliens™. 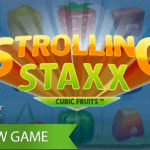 The game certainly belongs to the category cheerful slots, accompanied by other NetEnt slots such as Fruit Shop™, Starburst™, Flowers™ and Fruit Case™. Less is definitely more regarding the gameplay used for the Stickers™ slot, but I can’t say the same about the amount of colours used as you can expect a true colour explosion, with every element of the game, from the symbols to the sounds is sure to create a bright and unforgettable gaming experience. 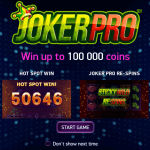 With modern video slots being more popular these days, beating the traditional classic slots, it is understandable NetEnt opts for a modern slot game over a classic one, even though some classic slots such as Mega Joker™ are still enormously popular. That the classic slots aren’t forgotten by the NetEnt developers, can be seen when opening the Stickers™ slot, enriched with modern, but traditional, fruit symbols added to the five reels. No matter if summer or winter, I am sure the fruity slot symbols and a cheerful tune will make you feel like summer, for sure getting rid of a bad mood in an instant. While a summer breeze will enter your room the moment you open the Stickers™ slot, and some very innovative slot features will keep you entertained, I don’t doubt the many betting options will attract a large group of players. No matter if a small player or a big player, with betting options between 0.20 and 200.00 I am sure there’s a perfect bet for you available. Playing with the lowest bet it means you will be playing with a minimum coin value of 0.01 in level 1. The fact that another nine levels are available, as well as seven different coin values, gives you a very wide range of betting options, perfect for every type of player. I would like to emphasize the Return to Player of 96.69% which comes very close to the the RTP of Jack Hammer™ (97%) and Jack Hammer 2™ (97.1). Though the Hit Frequency of Jack Hammer™ shows a percentage of 25.3% and Jack Hammer 2™ 23.6%, while Stickers™ is promising you a Hit Frequency of 28.36%. This means all three NetEnt slots are just as attractive when it comes to the chances of winning, but they have one more aspect in common, a very sticky slot feature. The Sticky Wild feature used for the Stickers™ slot shows a lot of similarities with the Sticky Win feature very well known from the Jack Hammer™ slots. And if familiar with the Jack Hammer™ slot or Jack Hammer 2™ slot, you probably do know that it has been the Sticky Win feature that made this slot game so immense popular, even years after it became available at the NetEnt Casinos. No wonder that NetEnt decided to bring back this particular video slot feature, although slightly different. Often used in the NetEnt slots, also Stickers™ has been enriched with a Wild symbol, but I’m sure you will be more interested in the other two slot features used for the Stickers™ slot. This cheerful NetEnt slot is featuring regular Wild symbols, but this time they will transform into Sticky Wild symbols and activate Sticky Spins which might look a little bit boring as no Free Spins or Bonus Game has been added, but I do promise this slot game offers you a truly high level of excitement. It has been a while ago NetEnt developed the Jack Hammer™ slots, but until today these two video slots are incredibly popular and therefore often used for online casino promotions at the NetEnt Casinos. Time to bring another sticky slot feature into a NetEnt slot, NetEnt must have been thinking, just to see if a variant of the Sticky Win feature would become just as successful. 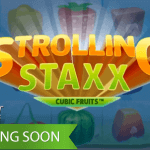 I certainly think the Sticky Spin feature has the potential to become just as popular, especially to those group of players who also enjoy playing video slots like Starburst™, Fruit Shop™ and Fruit Case™ as well as the Jack Hammer™ slots. Stickers™ offers a perfect mix of these NetEnt slots with the Wild playing a key role, while of course substituting for any other symbol in this NetEnt slot. When a Wild appears on the reels, it will act as Sticky Wild awarding a Sticky Spins. When a Sticky Spin is being awarded, you will notice the Wild sticking on the reels for at least one Re-spin. This sticky slot party can be over after one Re-spin, but if Sticky Wilds appear on the reels during the Sticky Spin, all Wild symbols hold their position and another re-spin will be the result. This sticky slot feature will keep on going, just until no new Sticky Wilds appear on the reels with the game turning back to normal. While the NetEnt Games suite keeps on expanding and new online slots are released every month, the same goes for the range of Touch® Games developed by NetEnt and available at tens of mobile casinos. 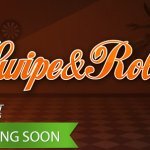 Nowadays every new slot game developed by NetEnt can be expected to be launched as a Touch® game too and the same goes for Stickers Touch®. 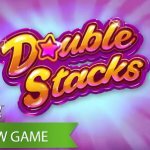 Both NetEnt Games will be delivering the exact same game slot experience, gameplay, slot design and sticky slot features. None of the high quality the NetEnt Games are famous for will be lost and therefore, I am 100% sure you will enjoy Stickers™ as a mobile game as much as an online slot.